“AMZ GROUP” LLC is a manufacturing enterprise whose main specialization is the production of aluminum alloys, ferroaluminium, ferrotitanium, and also fluxes for diluting and deoxidizing of metallurgical slags. Our plant has been successfully developing since 2014. In the market of aluminum alloys “AMZ GROUP” has proved thanks to the wide range of alloys based on aluminum, which meet to the international standards. Reasonable prices and high quality – a conceptual characteristic of our production. We work to provide you the most favorable conditions of cooperation. Any material from our range can be quickly produced and delivered to the consumer. Terms of delivery in each case are discussed in the Delivery Contract. “AMZ GROUP” LLC aims to become your reliable partner. 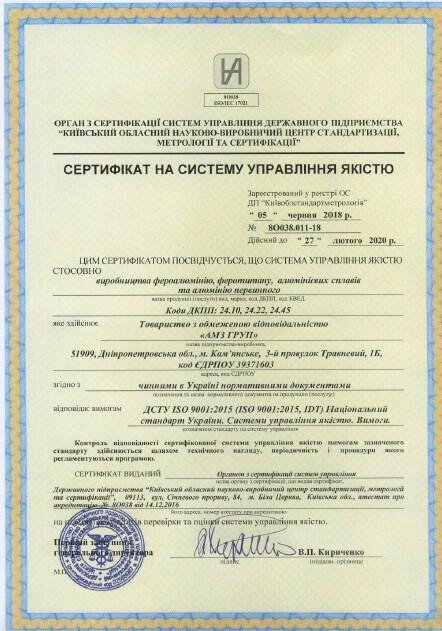 Our company has an ISO certificate confirming that the quality management system in our company complies with the international standard ISO 9001: 2015. Our representative in Europe – the company AG “ALGESS GROUP”.